BCCE 2018 was held at Notre Dame July 29 – August 2. Maria Gallardo-Williams and Holly Walter Kerby were nice enough to allow me to interview them about the inaugural Mole Storytelling Jam they created and hosted as part of the conference. Deanna: Tell me a bit about how you came to host a storytelling event. Maria: Well, teaching chemistry is a challenge. Maria: The content can be difficult. Many students are afraid or just don’t want to be there. Holly: And then, they have their own problems that have nothing to do with chemistry. Maria: We get better at teaching the longer we do it, but we’re isolated in our own classrooms. What we learn doesn’t help other teachers facing the same problems. Deanna: So where does story come in? Holly: At the 2016 BCCE. That’s where we met. Maria: Yes. At the Sunday night social. Holly: And somewhere in the conversation we got on how it would be great if teachers could share their wisdom with other teachers, so we wouldn’t all have to reinvent the wheel. Holly: And we decided story was the perfect way to communicate the stuff you’ve learned to other teachers. Maria: We thought about organizing a symposium. Or giving workshops at the next BCCE. But that didn’t go anywhere. 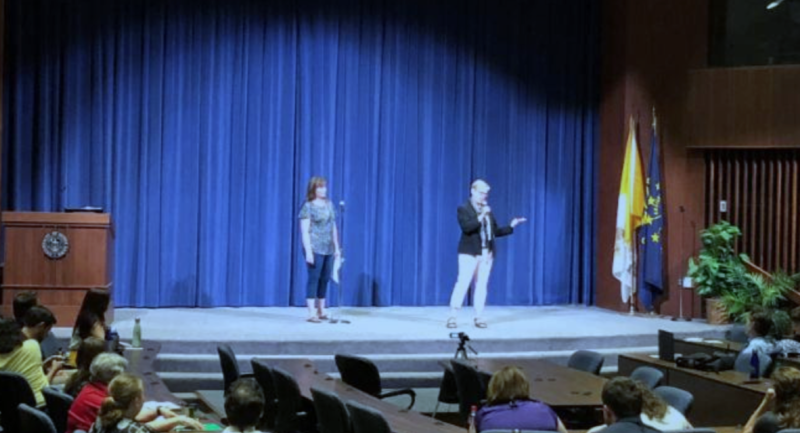 Holly: And finally, we got the idea to host a storytelling jam event at the BCCE 2018 held at Notre Dame. Deanna: How did you get chemistry teachers to tell stories? Holly: A few volunteered, but mostly, we asked them. We looked for people we knew could tell a good story and we tried to get teachers from across of the chemical education community. Deanna: What do you mean? Maria: Chemical education researchers, and graduate students. Maria: We asked them to tell a story about how they learned something they wished they’d have learned earlier. Holly: And then Maria told everyone on Twitter. Maria: And we gave out fliers at the Conference. Deanna: So, if it was not a symposium, was it still scheduled as part of the conference? Maria: Yes. It was scheduled as a Birds of a Feather. Tuesday night in McKenna Hall. Maria and Holly Together: The Mole! Maria: Which amused us to no end. Deanna: How many people attended? Maria: About one hundred fifty. Maria: Holly and I were the emcees. Holly: And here’s the thing: every story was incredible. But the audience was the most incredible. Holly: And answered questions out loud and burst into applause and groaned in empathy. It was glorious. Deanna: Anything else you want to tell people? Holly: We hope you like them. Because we love them. Maria: Yes. And send us ideas about how to keep this going. Deanna: Thanks for talking. And thanks for the podcasts. I loved them as well. Maria: Thank you. It was great to talk to you. I have spoken with several of the chemistry instructors that spoke at The Mole Storytelling Jam as well as many members of the audience. Some phrases that were repeated over and over in regard to the event: “It was awesome!” “It was magical!” “I had such a great time!” Several people expressed that listening to other chemistry instructors share their personal stories made the listener feel more connected to the wider chemical education community because the audience could relate and see themselves in every one of them. Even though I attended BCCE and wanted to go to the event, my schedule did not allow for the time to attend. I was happy to hear that Maria and Holly were uploading the stories as podcasts to Soundcloud so that others could enjoy them. Having now listened to each of the stories, I agree with friends that said it was magical! I hope you will take the time to listen. You might groan with sympathy a few times. You will definitely nod your head yes. You will laugh out loud! You will be inspired. I hope that I will be able to attend The Mole at other conferences in the future. I can’t wait to hear your stories! Tom Kuntzleman: The Charred Marshmallow Souffle - Tom is an Associate Professor of Chemistry at Spring Arbor University in Michigan. Kristen Drury: Finding Your Niche - Kristen teaches chemistry at William Floyd High School in New York. Maria Gallardo-Williams: It's Not You, It's Me - Maria is an Associate Professor of Chemistry at North Carolina State University in North Carolina. Holly Walter Kerby: Mary Ryan is Never Wrong - Holly is the executive director of Fusion Science Theater and Faculty Emeritus, Chemistry and Playwriting at Madison Area Technical College in Wisconsin. Zena McFadden: Too Many Lab Rules - Zena teaches chemistry at North Boone High School in Illinois. Julia Winter: How I Built a 2.5 Million Dollar Business From a High School Classroom - Julia taught chemistry at Country Day High School in Michigan for many years. She is the founder of Alchemie. Ryan Johnson: The Long and Winding Road to Chemistry Ed - Ryan teaches chemistry at Doherty High School in Colorado. Lyniesha Wright: They're Just a Little Bit Taller - Lyniesha is a graduate teaching assistant at North Carolina State University in North Carolina. Diane Bunce: I Hate Cheating - Diane is Professor Emerita Chemistry Education at The Catholic University of America in Washington.